Wondering if I can still "save" this dying branch on my dwarf umbrella tree (Schefflera) houseplant?? I've never had much luck when it came to house plants but this one was really growing on me (ha! no pun intended!) and now it's suddenly dying! I've had it for about 3 months and recently put in a couple of those fertilizer sticks (for the 1st time since I bought the plant) about a month ago. ALSO, my cat has recently "escaped" up here to my office where I keep my plants. It's 2 floors above where the cats live and it's closed off so there's a slim chance of them getting in here usually. I didn't see her nibbling on the plant but it is possible she tried playing with it at least. Not sure if she's the culprit or the fertilizer or something else?? Notice how the branch has turned an ugly brown color about 3/4 of the way up. I'm afraid it it will continue all the way up and kill off those last 2 "bunches". Several leaves fell off at once (suddenly) only one other time and it was before the fertilizer. Other than that it's been healthy & growing. Any advice/suggestions would be greatly appreciated! TY!! I suspect this might be a watering issue; I note the pot its growing in is a tight fit inside the outer pot,and the soil within looks to be quite damp (although you may just have watered before taking the picture). When you water, if you do not empty the outer container after 30 minutes, that means the plant's sitting in water for some time, and that can cause rot problems at the roots which then affects the stems. I suggest you remove the plant from the pot and check what roots you can see - there must be some which are healthy because the second stem appears,for now, to be okay. Cut out the browned stem at the base, at soil level - you can try rooting the healthy green part at the top by cutting just below where that bare stem that's lost its leaves is, and stand it in a small bottle of water on a windowsill - keep it topped up and if that part of the stem is healthy, it will produce roots in about 6-8 weeks, at which point you can pot it up. For the rest of the plant, if the rootball is very wet, let it drain down a bit then put it back in its pot and this time, either find a larger outer pot to stand it in or just a tray. Water only when the surface of the soil feels a bit dry to the touch, but not so dry the soil has shrunk from the sides of pot, water thoroughly, and empty out any excess after 30 minutes. If you notice the other stem starting to go brown from the bottom, cut off the top and root that in a bottle of water and dispose of this plant. It might be wise to remove the fertilizer sticks when you decant it from its pot - if you're in the northern hemisphere, your plant does not need regular supplies of fertilizer at this time of year. And two of them seems a bit much for such a small plant - it would be useful to know precisely which product you used. What soil mixture should I use for my office Schefflera? How can you tell if a ponytail palm tree is dying? 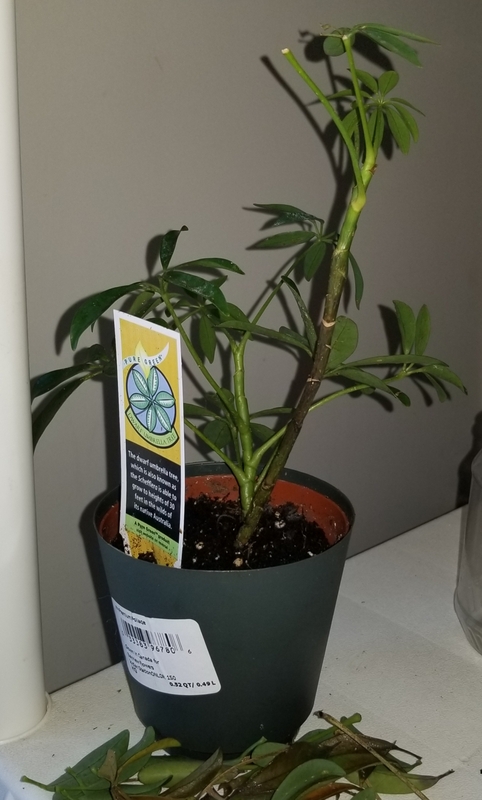 How can I care for my dwarf meyer lemon tree with leaf drop?